Barneys Youth is for high schoolers – guys and girls in Years 7-12. We meet on Friday nights to hear from the Bible and to encourage one another. We aim to make everybody welcome and encourage friendship and fellowship among the teenagers that attend regularly. We are a Christian youth group keen to know Jesus and proclaim Jesus. 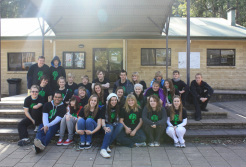 TEKNON - Teknon is our annual youth group camp that runs in the July school holidays. We spend a week together learning about God and having lots of fun. Teknon is a great experience for the youth and provides a great opportunity for growing in our relationships with God and with one another.